Norway is looking forward to the upcoming Constitution Day on Friday 17 May. Norwegians celebrate their constitution from 1814 through children’s parade with marching bands and various activities in the communities. In the afternoon, it is common for families to meet for coffee and cakes. Delicious cakes are an important part of the celebration. There are countless exciting variants – but it is common use fresh berries which have excellent taste and is very decorative as ornament. 1. Preheat oven to 150 C / 300 F degrees. 2. Mix egg white, sugar and lemon juice in a bowl. Put it over a pan of boiling water. The bowl shall cover the pan completely. 3. Whisk the meringue mixture with an electric whisk until it becomes thick. Gently blend in the blueberries. 4. Pour the mixture on a plate with parchment paper that has been cut into a circle, about 24 cm in diameter. 5. Bake on the bottom shelf for about 60 minutes. Let it cool, preferably inside the oven. 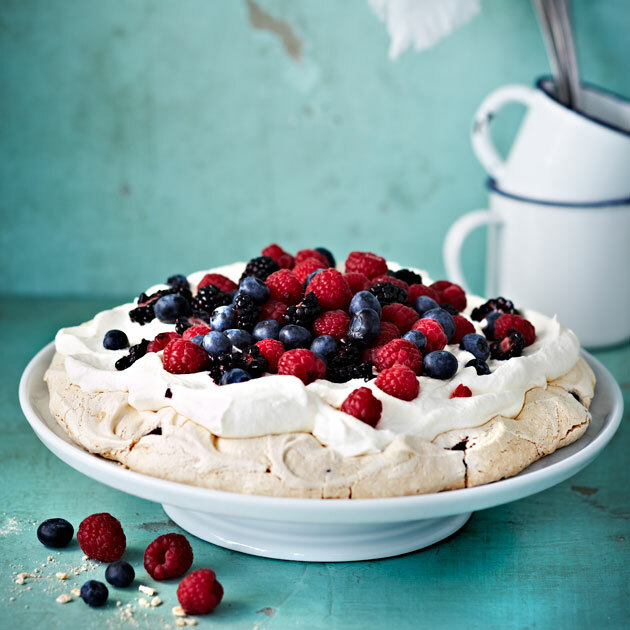 Whip cream, and decorate the meringue with cream and berries. Tip: If you sprinkle some sugar over the meringue before baking it, it will get extra crispy. This cake is free of gluten. You can also use a cream substitute for a milk-free cake.